Boxes and Bags oh my! Anyone who has spent a little time with me has heard my raves about the latest beauty craze - sample delivery boxes. I really should be getting a commission for how many people I share my love for them with! I subscribe to two... well three of them. Birchbox, Ipsy and Birchbox Men. I figured I should share a little insight to these lovely new marketing strategies to help anyone interested in choosing the one(s) that work best for them! First off, a few notes on how these work. Its a subscription based deal, where you can either pay monthly with the chance to cancel at any time, or you can pay for longer blocks of time, which ultimately knocks the price down a bit. You can also 'gift' them to friends, family, coworkers etc. (which came in quite handy over the holidays!) The whole concept is really a smart marketing strategy on their end. I am sure majority of the time all the products they include in the boxes are given to them, free to charge. Because in turn, those customers may come back to the site to purchase the the full size product. Brilliant. (If only I thought of this first!) And I know for me, theres nothing better then a package with surprise goodies showing up in my mailbox once a month! -6-7 samples of the best beauty and lifestyle products including brands like Kiehls, Origins, benefit, Dr. Jart, theBalm just to name a few. Whats neat about the Birchbox is it not only comes with Beauty products, but lifestyle products as well, such as a new type of chocolate bar, headbands, toothpaste, the list goes on! -Learn tips and tricks from experts -every box has some insight on each product and sometimes even tips on how to use them. Their website also offers tons of beauty advice. -Heres the best part of the Birchboxes -Every time you go back onto the website after getting your box, you have the chance to review each product you get. Each review earns you 10 birchbox points, and every 100 earns you $10 towards purchases of full size products on the site. So basically, if you review all 6-7 products, you are getting $6-7 back in product... making the box only $3-4/month. Make sense? I had been banking my points for almost a year now and was just able to purchase over $150 worth in products. Yes, maybe it took a little while, but whats better then free? And to sweeten the deal when purchasing the items online - if they have been featured at any point in a birchbox, shipping is free. - 6-7 samples of the best grooming and lifestyle products. But the coolest part about this one is you usually get some full size items such as a pair of name brand boxer briefs, whisky stones, knit tie, iPhone speaker etc. I have looked up these items on the website, and they often are more then $20, so even without the samples in the box you are still getting a full return on your dinero! -Approximately 5 items (sometimes full sized!) included of just beauty products (no lifestyle) with brands like Juice Beauty, Macadamia, Mirabella, Nume, St. Tropez, and Zoya. 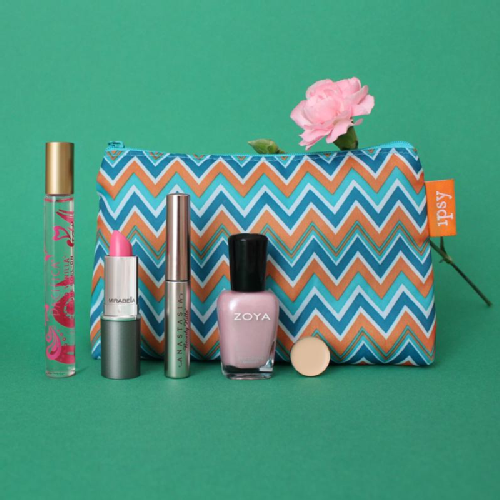 Plus it always comes in a cute makeup pouch. This is definitely more for the beauty enthusiast. Who needs chocolate when you get get a full size lipstick?? -Learn tips and tricks from experts -every box has some insight on each product and sometimes even tips on how to use them. Their website also offers tons of beauty advice - even more so then Birchbox I find. - So Ipsy unfortunately doesn't offer a rewards program like Birchbox (they do, but only through referrals not reviews), BUT the reason I keep hanging on to it are the actual products themselves. As I mentioned you will often find full size products in the bag - which automatically makes you feel as though your getting your monies worth. Also, if you currently subscribe to any of the other companies out there, feel free to post a comment and share your thoughts!